It's no secret that Minecraft, a simple, yet amazingly addictive and immersive game, is coming to Android - we've been hearing about it for months. It's also no secret that the first version, exclusive to Xperia Play, will be unveiled at E3 in just a few weeks - the conference is scheduled for June 7th-9th. 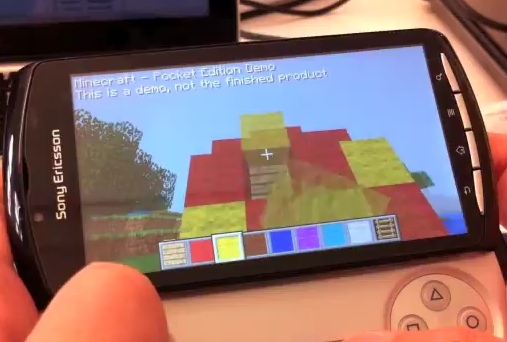 However, what exactly the game would look and play like on a mobile Android device when it is released was unknown... until today that is, when the developer, Mojang, released the first ever video of the gameplay on the web. Minecraft fans, brace yourselves, for what you're about to see will cause uncontrollable twitches, anxiety, excessive salivation, and possibly even diarrhea. As someone said in the YouTube comments, "Texting will no longer﻿ be the #1 reason for car crashes..." Start the countdown, folks.